There’s been quite a flurry of activity over the past couple of weeks where a lot of bands have obviously been waiting for the new year to unleash themselves onto the world. Here’s a couple of bits and pieces that have come to my attention, some by new artists, some by more established acts. Fistly some videos, first of which is Moya, covering the Primal Scream track which got remixed to become Loaded. She’s playing at the Juice New Music Showcase next week if you like the sound of that. Then there’s Sebastian Blake, who’s currently working on recording his debut EP, but has put out this taster. There’s also a new track by Chris T-T, who put on last sunday’s Midwinter Picnic. Lastly, there’s a brand new solo release from Matthew from Fujiya & Miyagi, who is recording his own stuff as Ampersand (being neither Fujiya or Miyagi, obviously). Happy New Year from Brighton Music Blog! It’s that time of year when pretty much the whole media is looking back at the past year and forward at the year ahead. We only started the blog back in October, so let’s just look ahead. 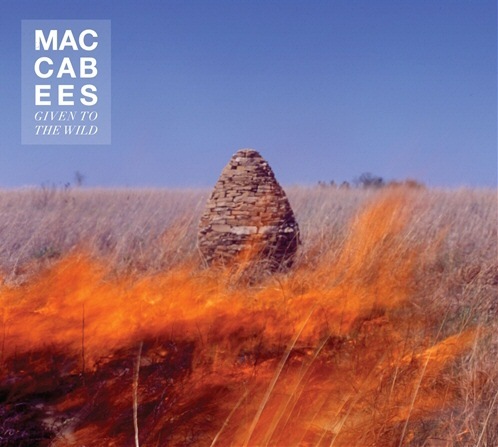 Already it’s looking like a good year for Brighton Music – The Maccabees new album Given To The Wild is out next Monday, with Foxes! eponymous debut album out the following week, and Brakes have posted on Facebook to say that they’ll have an album out later this year too (although they have since tweeted to tell us not to get our hopes up!). I’m sure that’s just the tip of the iceberg. We’ll have reviews and photos from some of those gigs in the coming weeks. And as if that’s not enough, Brighton Music Blog contributor Jon Southcoasting is DJing his All Time Top 100 at the Coopers Cask this saturday. Jon knows a thing or two about music, so it’s bound to be a good night. Shrag first came to my attention (musically at least) last year when I saw them supporting Pains of Being Pure at Heart at the Concorde. I fell in love with them immediately – they reminded me of loads of the bands I loved in the mid nineties – Prolapse, The Delgados, Bis and Heavenly. 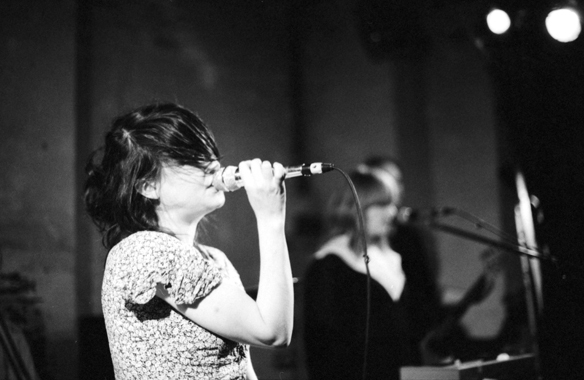 Funny then, that support at the gig was Tender Trap – fronted by Amelia Fletcher, who also fronted Heavenly all those years ago. 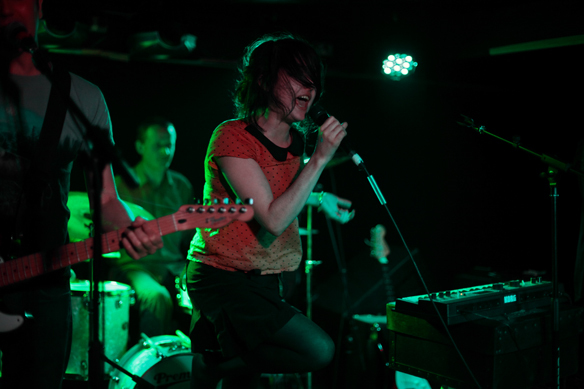 For most of Tender Trap’s set, Shrag lead singer Helen King stood at the front transfixed. It must be quite an honour to have one of your heroes supporting you at a gig in your hometown. Since this is the Brighton Music Blog, not the Oxford Music Blog, so I’ll skip over Tender Trap’s support and head straight onto Shrag’s set. They played a roughly equal mix of tracks from 2010’s Life! Death! Parties!, earlier tunes and songs written for their upcoming album due to be released next year on Fortuna Pop. The band don’t really aim for professional – the start was delayed by a couple of minutes while the bassist was fetched from the bar, and when a string broke on Bob Brown’s guitar, he didn’t have another spare guitar to swap with, instead having to use keyboard player Steph Goodman’s, which was “impossible to tune”. But it doesn’t matter one jot – I’d rather see a band who are funny, and intense, and who I can relate to instead. Their set was over far too quickly – one of the downsides of fast paced punky indie pop. Let’s hope they play again soon when their album comes out in the spring.